With New Jeep Packaging, Will Mattel’s Legacy Collection Stay Exclusive? 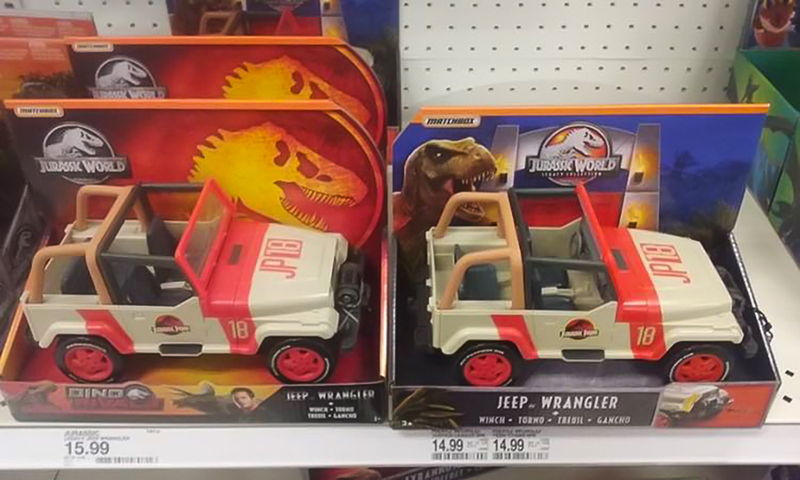 According to an image from eagle-eyed collector Diamonback, Mattel’s Jeep Wrangler vehicle from the 2018 Legacy Collection appears to be getting a Dino Rivals re-packaging treatment for 2019. We’ve already seen select human figures, the super articulated Indoraptor and some of the Hatch n’ Play dinosaurs re-packaged with Dino Rivals artwork, but seeing it here on Jeep Wrangler may mean something bigger for the future of Mattel’s retailer-exclusive Legacy Collection. As evident in the photo, the Legacy Collection branding has been completely removed from this new version of the toy. Meanwhile, Mattel’s other retailer-exclusive Battle Damage assortment continues to carry over the Battle Damage branding into 2019. Does this mean that certain items slated for the Legacy Collection won’t continue as Target exclusives toyline this year, and instead enjoy a wider release under the Dino Rivals label? While it’s too soon to tell based on one photo (taken at a Target store, by the way), it could certainly be significant that the Legacy Collection branding has been removed from this particular item. We’ll update with any new information on the 2019 Legacy Collection as it becomes available here and on our Instagram, Twitter, Facebook and YouTube pages, so be sure to follow us on those platforms for the most up-to-date Jurassic collecting news! The Legacy version of this Jeep is on toysrus Canada site. So is legacy not Target exclusive anymore?